In 2019, we’re celebrating all the ways a person can find their #CourseToSuccess. 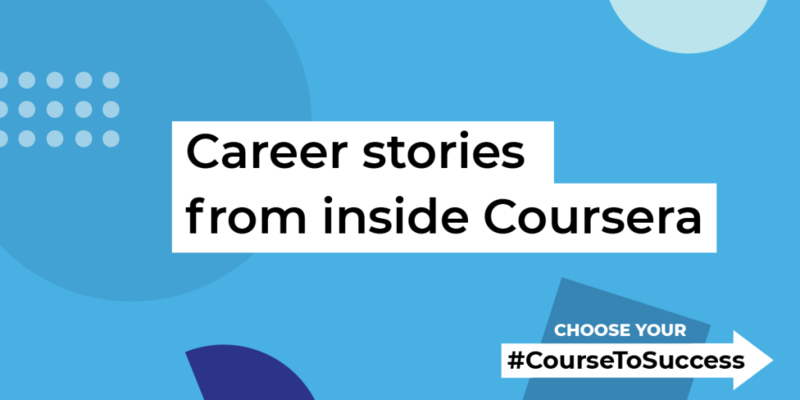 There are many different paths you can take to launch a successful career, and we asked our team to share the journey that led them to Coursera. We hope their stories inspire you to take the next step toward a career you’ll love. I was a derivatives trader on Wall Street, and I found that I wanted to find a scalable way to empower people to better themselves. After trading for over 10 years, I recognized an inner thirst to use my skill set to build something more tangible than an investment return profile. I decided that as I moved forward in my career, I wanted to look back and see that I developed something impactful. I decided to help address the skills gap issue. There are large swaths of the workforce that are un- or underemployed because their skills don’t meet the needs of our ever-evolving workplace. Coursera helps make top quality education accessible in a way that has never been seen before. Every day at Coursera, I am using my past experiences to help build out global programs to reach more learners around the world. I bounced from asset management to athletics to higher education before I came to Coursera. The work I did in higher education set me up well for a role on the University Partnerships team –– I feel like I really understand the inner workings and the needs of the universities I work with. I also did a part-time MBA program while working full-time, so I understand what degree learners are going through from personal experience. I think that what Coursera is offering is even better than the experience that I had doing a part-time MBA. I had to physically go to the business school after work a few times a week, and spend many full weekends there; our online degrees allow learners to leverage breaks in their schedule and free time. Having to physically attend school in the evenings and on weekends is difficult for busy people. Coursera offers a whole new layer of flexibility for our learners (without sacrificing quality) and I think that’s really special. I wanted to pursue jobs in marketing because I felt that it was a field that required a blend of creative and analytical skills. My first job in marketing wasn’t a good fit, so I embarked on a journey to conduct informational interviews with marketers at my previous company. That’s how I discovered product marketing. I was excited to jump into the product marketing space, so I cold-emailed a bunch of product marketers until I found someone who was willing to let me shadow him. He eventually hired me as his backfill during his paternity leave, which helped me get hands-on experience. Using the product marketing experience I gained, I was able to land a full-time role in product marketing and I haven’t looked back since! I really love the work I’m doing at Coursera and I’m so grateful to be part of a company that’s using education and technology to transform the lives of people around the world. After graduating from college and grad school, I accepted an internship at a small startup called Clever Sense. We made a restaurant recommendation app called Alfred, and I answered every single support ticket that ever came in for the app. It was really fun being the voice of Alfred, but before I knew it, we were acquired by Google. I came to Coursera because I was looking to switch my career to be closer to education, which is a field I’ve been passionate about for a long time. At Coursera, I was the first member of the Product Specialist team. I was responsible for conveying learners’ user experience and making sure that new product features are working for them. I also helped prepare our customer support teams to be aware of and ready for platform updates, as those tend to generate a lot of questions. Thanks to this first role at Coursera, I developed skills like clear communication, problem-solving, and making data-driven decisions. All of these apply to my current role leading the Learner Services team. Take the first step toward your career goals by building new skills. Find your #CourseToSuccess today.